Hello adventurers of Aden, Im here to bring you a guide to completing the level 50 Quest. If you find any errors, please e-mail LC at web@lineagecompendium.com. Enjoy! And remeber to use the LC maps to guide you on your quest! Good Luck! Go to Ivory Tower 3f and speak to the NPC, Dicardin. 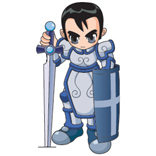 To begin the quest, you need 4 level 50 players, one from each class: Royal, Mage, Knight and Elf. They will all be initiated to the quest and must go to TOI 2f to begin the quest. All members of the party are randomly distributed throughout the first level. Follow the path and meet your party in the center. On the first level, there are Spirit of the Ancient Person, different skeletons and deaths. You should hunt here for a while to build up a supply of Ancient Man's Arrows, which are to be used with the Ancient Man's Bow that elves receive from the Level 45 Quest. Only the death drops these arrows. The mops on the 1st floor cannot see players using COI. (pictured here is the quest team killing a spirit. On the second level, there are 4 paths that lead to a randomly located NPC. Your party must find this NPC (Ancient Person) to move to the next level. It is advised by people who have taken this quest that if you don't find him quickly, you should just abort the quest and start over at the next respawn of this NPC (anywhere from 1h - 4.5hr). 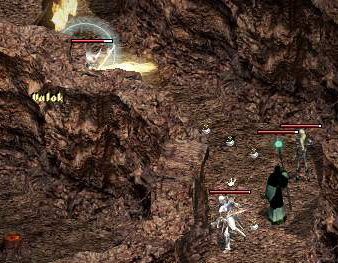 Only 1 member can use the NPC at a time and the rest of the party must search for the NPC which spawns in a random location. It is wise to let these classes use the NPC in the order: Mage, Prince or Knight and Elf last. (Elf should have nature's blessing). This is the most annoying part of the quest. There are groups of Enraged Ancient Person (looks like necro) and the knight can kill the fire spirit (red). The blue spirit can be killed using water spells, the white spirit can be killed using earth spells. Remember, you dont need to kill these spirits, unless they block your way. Third floor has Lesser Dragon, Medusa, Nightmare and Dire Wolves. You need to use Weak Elemental on these monsters to determine their element. The quest team has found that the knight has to kill the lesser dragon, elf has to kill the dire wolf which is weak to water, mage to kill medusa and prince has to kill the nightmare. These monsters each drop a key, one key for each class. So, you need to hunt them until you have one key for each member of your party. These monsters don't drop items to players in a party, so the procedure is: Determine their element, the appropriate player leaves the party, kills the mop, and joins the party again. The drop rates can be annoying, just remember to keep killing until you get the key. After all four keys are obtained, head east to open the doors. The prince opens the 1st door, 2nd by knight, 3rd by elf and last door by the mage. Now for the 4th floor. On the 4th floor, you will see Varlok's Servent. He looks like a imp elder, but a evil red colour. It is smart to enchant up before casting cancel on the imp. Once cancelled, the imp will turn into a demon. It seems he hits for about 50 damage per hit. He is much weaker than the real demon on Ivory Tower 8th. End the demon to obtain the key of fate. There are two paths after you open the 1st door using the Key of Fate. If you go south, you will find 6 boxes. (quest team didn't get any items from them because they were already opened). If you go north, you will see Varlog waiting for you in his room. Enchant up and use Counter magic scrolls. You have to kill Varlok to receive items for the quest. Varlok does about 100-200 dmg per hit. His ranged magic attack can deal 300-400 dmg per hit. TuffBuff died previously from this magic attack in 1 hit. Remember that counter magic is very key in this battle. Varlok will drop you his eye, claw, sword, and heart once defeated. These items are tradeable. Return to Dicarding to get you quest item. You may wish to not accept the item in effort to help other people with the quest. It is confirmed by NCSoft via Seoul that you may take the quest multiple times as long as you don't accept the quest item from Dicarding. *TIP* Bring Condensed Clears and Clears. Bring all the good stuff like Magic Gems etc. You really need Counter Magic for defeating Valok. Bring Rings of Fire and COI. Try to borrow lots of good items for this quest. *Facts* Your HP decreases per tick in the quest areas. TuffBuff found that his HP went down 5-7 per tick with 18 CON and Marak, who has 11 CON loses only 1 HP per tick. In addition, all quest floors from 1f to 4f give you special mana regeneration. You will regenerate mana even when you're over-weight. No animals were harmed during the creation of this guide. 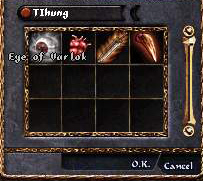 Special thanks goes to the quest team: Marak2001(prince), Chance(elf), TIhung(Knight), and TuffBuff(Mage). I also want to thank HERC/TuffBuff for spending time sending me these screenshots and helping me write the guide. 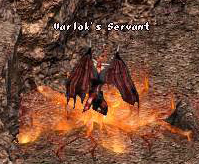 In a side note, Marak and TuffBuff did not accept their quest items and will help friends complete the level 50 quest.